Around the massive volcanic caldera of Bali’s most famous volcano, Mt. Batur and the shores of its crater lake, lies spectacular and picturesque hiking terrain. At Bali Sunshine Tours you can arrange competent English speaking guides and a packed breakfast to enjoy as you watch the sunrise. On a fine day there is a view of Mt. Abang, and Mt. Agung as well as the distant Mt. 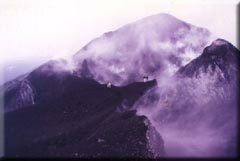 Rinjani in Lombok. After the descent, plunge in the hot springs, or take a boat trip across the lake to the Bali Aga Village of Trunyan, before driving back to Lake View Hotel for lunch. 4.00 Leave Lakeview by private transport down to the edge of Lake Batur where the trek begins. The climb up to the peak of Mt. Batur will take approx. 2 hours accompanied by an experienced guide. 5.00 A stop will be made for a short break and drinking water is provided at no extra cost. 6.00 Arrive at the peak of Mt. Batur where you have the opportunity to enjoy the view of three nearby mountains – Mt. Abang, Mt. Agung and Mt. Rinjani in Lombok in the first light of the day. Coffee will be served at dawn. 6.25 After coffee break, watch the sun rise over the hills behind the eastern edge of Lake Batur. 6.45 Descend the path leading toward the lake, with another brief stop en route. Drinking water will be provided. 8.45 Arrive back on the shore of Lake Batur where a stop is made at the Hot Springs for a refreshing bath. 10.10 Arrive at the Hotel. 11.30 Luncheon will be served.